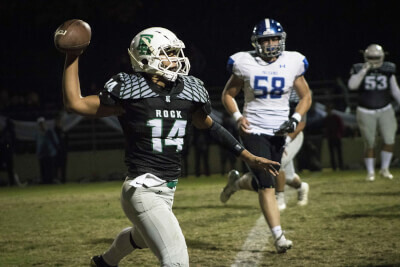 The Eagle Rock High School varsity football team beat Palisades High School with a score of 24–21 in the quarterfinal playoff game for the open division California Interscholastic Federation Los Angeles City Section (CIFLACS) Championship Friday Nov. 9. Eagle Rock High School Football is a member of the East Region of the Northern League of 11 Man Football within the CIFLACS in the greater Los Angeles area. The team has carried an undefeated 9–0 record this season, bringing them into the postseason. This was the first varsity football playoff game played at Eagle Rock High School’s home field, according to head coach and Dean of Eagle Rock High School Andy Moran. “We’re ranked second in the city [Los Angeles], and it’s really unprecedented here at Eagle Rock,” Moran said. Los Angeles is home to just over 70 high schools split up into three divisions for athletics, according to Moran. The Eagle Rock High School football team is currently vying for the CIF Open Division championships out of eight teams. After the game on Friday, the team has the ability to potentially play for two more weeks out of the three remaining rounds of competition. Their next game is on Friday, Nov. 16 against Garfield High School, where they will compete in the semifinals. “We’re the first team from our league, the Northern League, to compete in the open division, as well as hosting a playoff game,” Moran said. Many team members call the field at Eagle Rock High School the “Dust Bowl” since it is more dirt than grass, according to Occidental College defensive lineman and Eagle Rock High School alum Justin Martinez (first year). Currently, the team does not receive as much funding as other teams do, so the opportunity to host a playoff game is special to the school and the larger community, Moran said. Last year, the team was very successful, maintaining an 11–2 record and losing the semifinal game in overtime, according to Moran. Going into the playoffs, the team was ranked sixth in Los Angeles. Many initially viewed this year as a rebuilding year because so many seniors graduated last year, Moran said. Martinez was one of those successful graduating seniors from Moran’s team last season. “Typically, Eagle Rock students don’t go on much further than perhaps junior college football,” Moran said. Including Martinez playing for Occidental, other graduating seniors went on to play at Pasadena City College and the National Association of Intercollegiate Athletics colleges in the Midwest, according to Moran. Other graduating seniors went to college not only to be student-athletes, but to get an education, Moran said. “One of the things that attracted me to playing for Oxy is the ability to help bring the team back up from where they were last year,” Martinez said. Team chemistry, culture and coachability are three factors that make the Eagle Rock football team stand out, according to Moran. Martinez said that two of his best friends are from the team. Practices have changed over the course of Moran’s tenure, citing new NCAA and subsequent CIF rules regarding concussion protocol and safety within the sport of football. Similar to last season, there are 26 graduating seniors currently on the team. The players all notice and appreciate what a special and successful team it is due to senior leadership, according to left guard Jericho Martinez (junior). Everyone on the team is accepting and judgment-free, Justin Martinez said. By having such a large and influential senior class this season, their leadership has been a huge factor for such positive team culture, according to Moran. “Everyone being accountable, responsible and coachable has really helped develop this team,” Moran said. Both of the Martinez brothers played together on the varsity team prior to Justin Martinez’s graduation last spring. The two started training together when Justin Martinez was in ninth grade and Jericho Martinez was in seventh grade. Since they play opposite positions to each other, the two brothers pushed themselves and each other to be better teammates and athletes, according to Moran. Justin Martinez said that he and his younger brother would practice and strive to be the best they can be. “We got to play together for two seasons and it was really awesome to get to see him [Jericho] grow and move to where he’s at now,” Justin Martinez said. This is the third time in 91 years that Eagle Rock High School has gone undefeated, according to Moran. The team is hoping to win the Open Division championships, yet knows it will not be easy, according to Jericho Martinez. 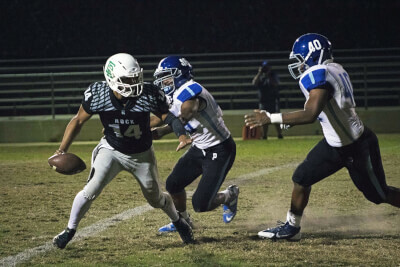 One of the factors that make the Eagle Rock High School football team so special is the diversity of the surrounding community, Jericho Martinez said. “I feel like Eagle Rock is such a special place to be, and growing up here opened my eyes on how diverse this neighborhood actually is,” Jericho Martinez said.